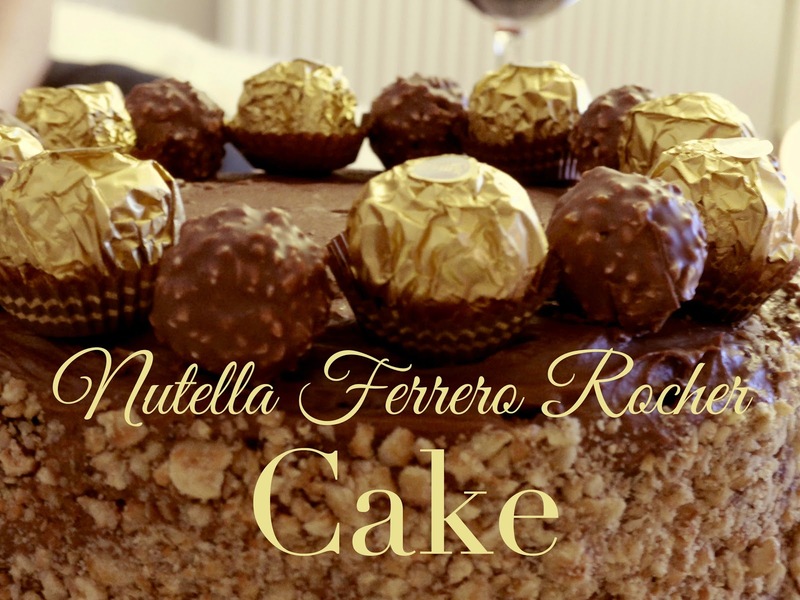 It’s time to share the amazing recipe of this Nutella Ferrero Rocher (cheese-)cake which I baked for my boyfriend’s birthday. It’s not really a cheesecake, but the middle layer contains some cheese. All the credits of this cake go to Wicked Good Kitchen where you can read the original recipe. 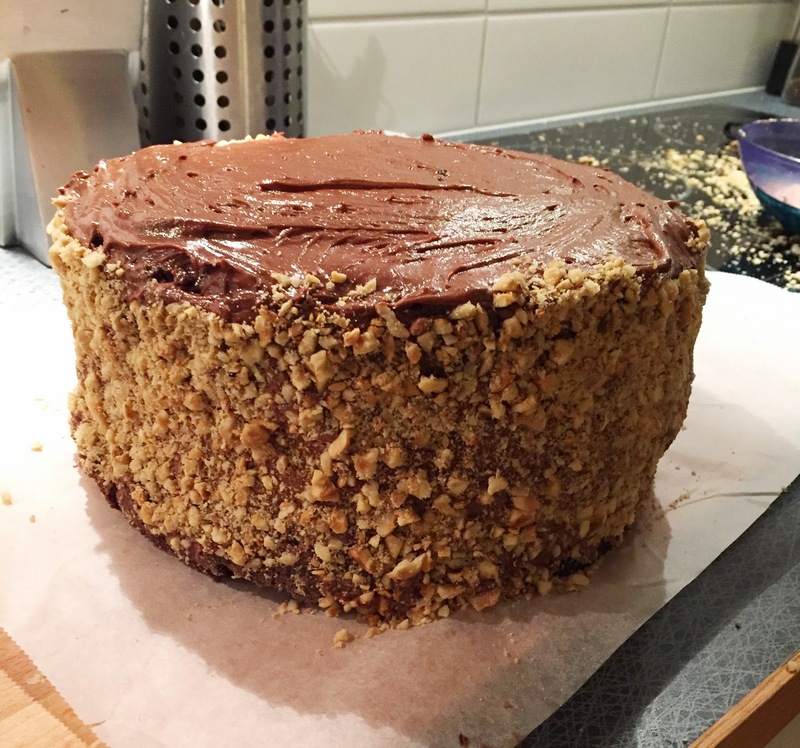 This was my very first cake ever, and I didn’t think that it was too hard or time consuming at all – and it’s amazing! I’d like to mention here that it’s advisable to cut the cake with a knife that has been dipped in hot water. Also, the cake is quite heavy, so small pieces are more than enough. It’s easier to give out a second slice then to throw away peoples rests because they couldn’t finish it. I suggest you start with the Cheesecake layer since it has to stay in the freezer for 5h, best even overnight. 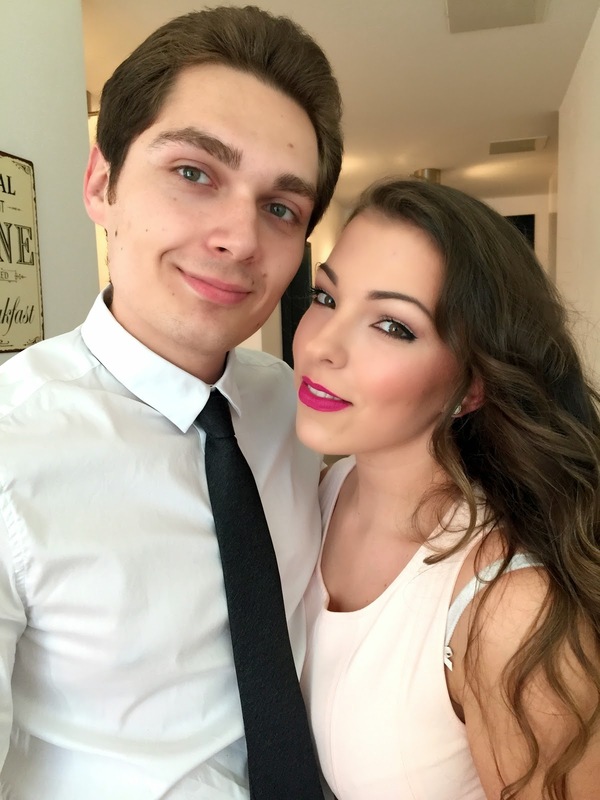 Preheat the oven to 160°C. Place oven racks to lower and middle positions. Place a baking dish filled with water on the lower rack of the oven. The middle rack should be just above the pan of water which will provide added moisture to help prevent cheesecake from cracking. Generously grease the spring form with butter and set aside. Use an electric mixer and beat the cream cheese, Nutella and vanilla until creamy. Gradually add sugar and beat until fully blended (you can scrap down the side of the bowl if necessary). Add the eggs, one at a time, blending well after each addition. Add the sour cream and melted chocolate and mix until fully incorporated and smooth. Pour batter into the prepared spring form. Place spring form pan on middle rack in the preheated oven and bake until the cake no longer jiggles, about 45 – 50 min. Remove the cheesecake from the oven and place on wire cooling rack. Immediately run a thin metal icing spatula around edge of the pan to loosen the cheesecake from the sides. This will prevent any surface cracking as the cheesecake cools and contracts. Allow the cheesecake to cool completely, at least 1h. Once it has completely cooled, place it into the freezer, covered with a plastic wrap. Let the cheesecake freeze for about 4 – 5 hours or overnight. Arrange oven rack in lower third of oven an preheat the oven to 175°C. Grease the spring form with butter. Line the bottom with parchment paper circles (you can custom cut it). Dust the greased spring form with flour, tapping out the excess. Using an electric mixer, mix flour, sugar, cocoa, baking powder, baking soda, and salt on low speed until well combined. Add oil, milk, eggs and vanilla; mix on low and then medium speed until well combined. Bring water and the hazelnut syrup to a boil in a heatproof glass in a microwave. Immediately, add the coffee granules and stir until dissolved. Carefully add the mixture and mix until well combined. Batter will be very thin. Divide the mixture into two equal parts. Pour one half of the batter into the prepared spring form and place in preheated oven. Bake for about 30 – 35 min until toothpick inserted into center comes out clean. Once the first layer is done, place the second part of the batter in the prepared (the same way as before with parchment paper, greasing and flour) spring form, and bake it for 30 – 35 min. Cool the cakes for 10min and run a metal spatula around the edges of each cake to loosen. Invert the cake and remove the parchment paper and cool completely. Use an electric mixer and beat butter until creamy. Add cream cheese, Nutella and vanilla; beat until fully incorporated. Gradually increase mixer to high speed and beat until light and fluffy. Gradually add cocoa and about 350 g of confesioners’ sugar, beating on low speed, until well combined. Add confectioners’ sugar until desired consistency for spreading and level of sweetness is reached. Before frosting cake layers, rebeat buttercream to ensure smoothness. Take 10-16 Ferrero Rocher candies and crush them into small pieces and set aside. 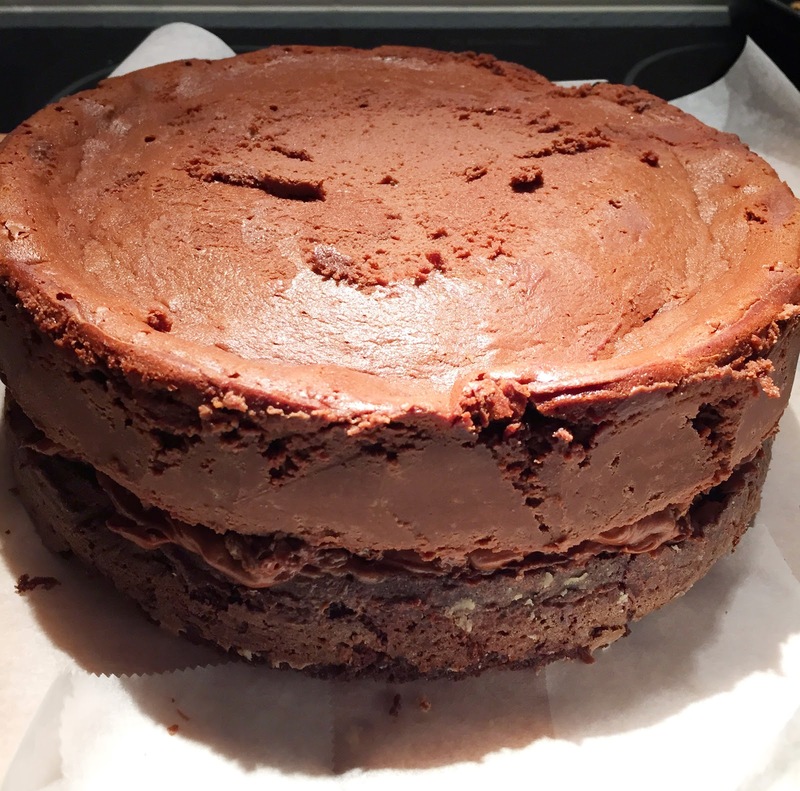 Place one cake layer onto a serving plate. With icing spatula, spread about 6 tablespoons of buttercream evenly over top of cake. 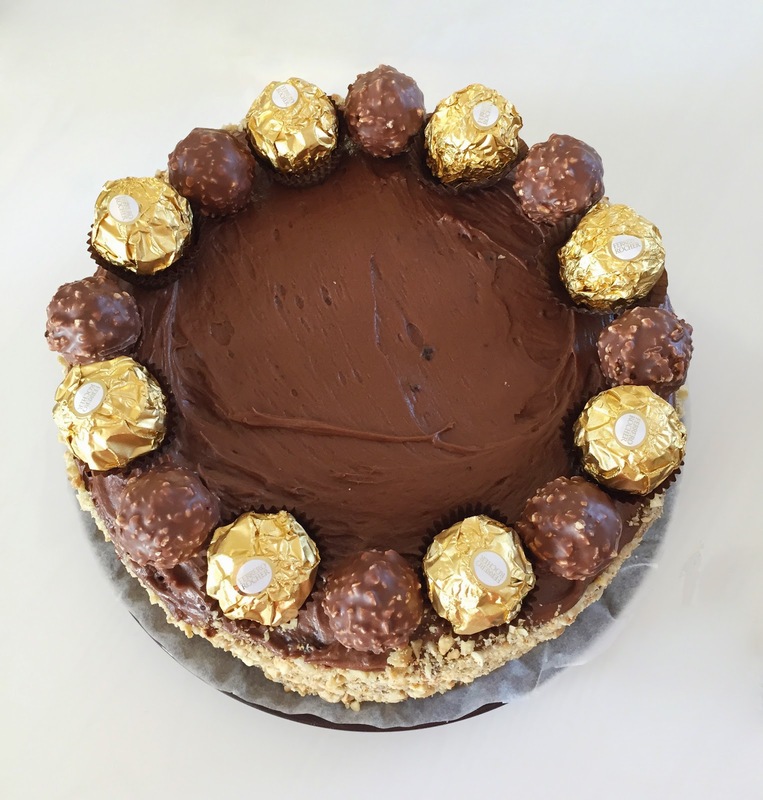 Sprinkle with half the Ferrero Rocher crunch then spread a few additional tablespoons of buttercream to cover, about 4 – 6 tablespoons. Remove cheesecake layer from the freezer. Carefully, slide a hot knife (warmed under hot running water and wiped dry) under the cheesecake to release it from bottom. If necessary, trim cheesecake to match the size of the cake layers. Place cheesecake layer on top of the first cake layer. 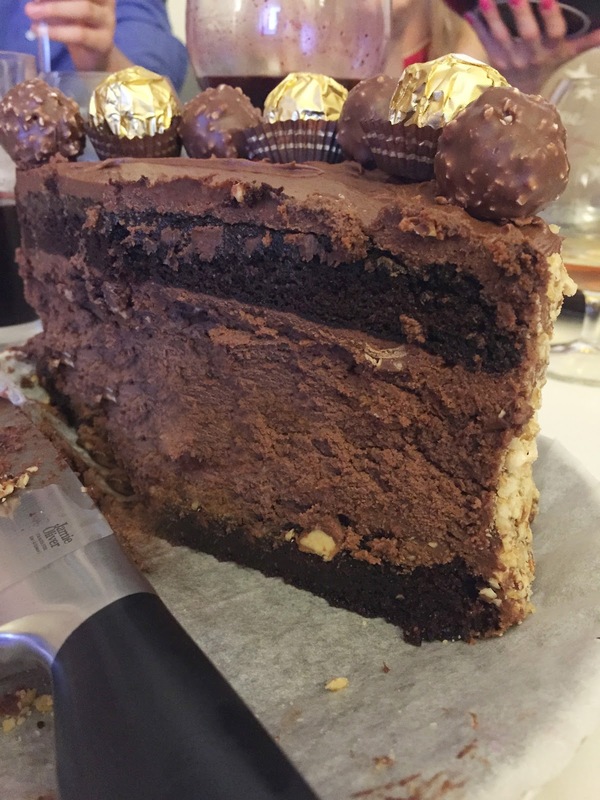 Spread 6 tablespoons of buttercream over top of cheesecake, sprinkle the rest of the Ferrero Rocher crumbs on top and add some more buttercream. Place second cake layer on top. 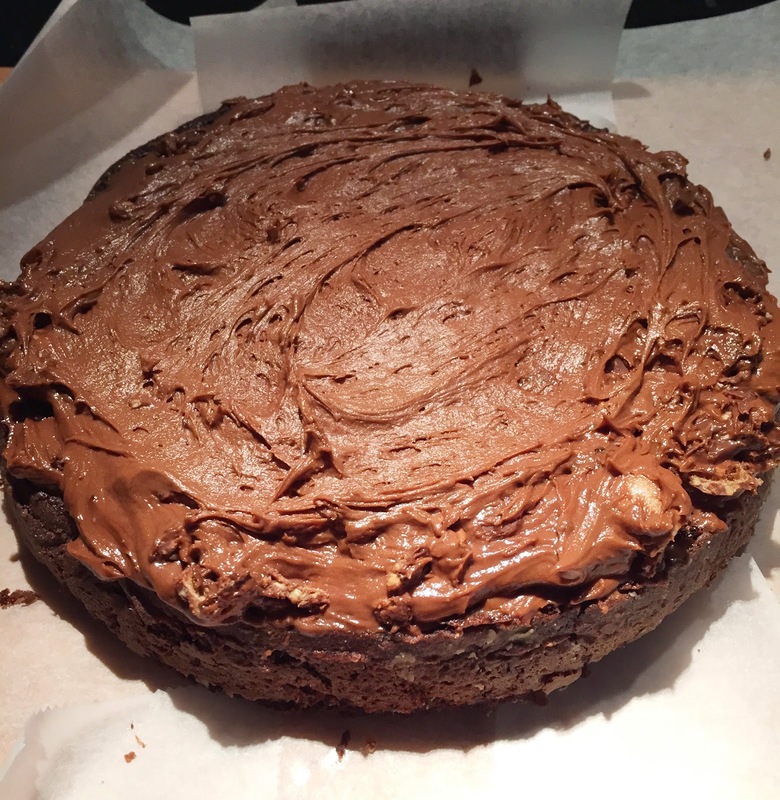 Spread frosting over top and sides of the cake, neatly and evenly. Decorate the sides with hazelnuts and place Ferrero Rocher candies on top. 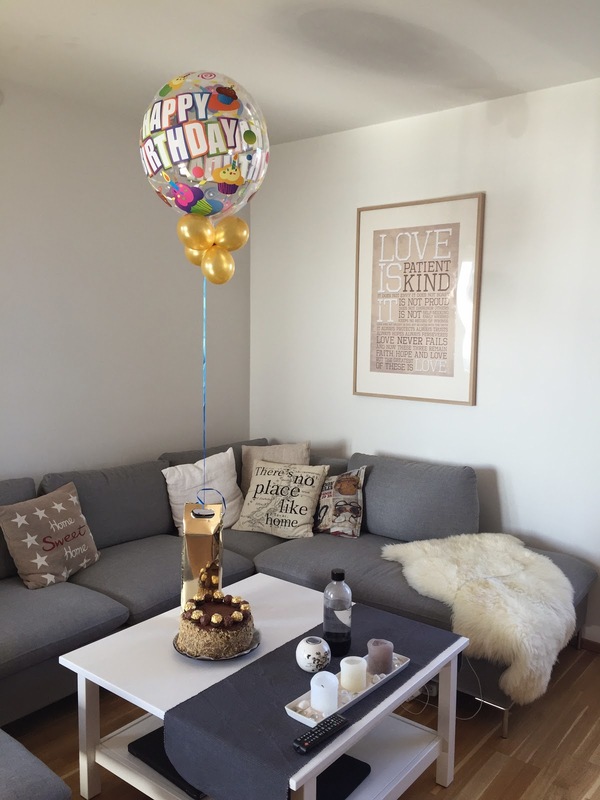 Keep the cake refrigerated and ENJOY! As you can see here, the cheesecake layer makes a huge part of the cake (it’s also the yummiest part), and I think that the ingredients could be cut down to half of the given in the recipe. Then the cake wouldn’t be this high and maybe less “heavy”.